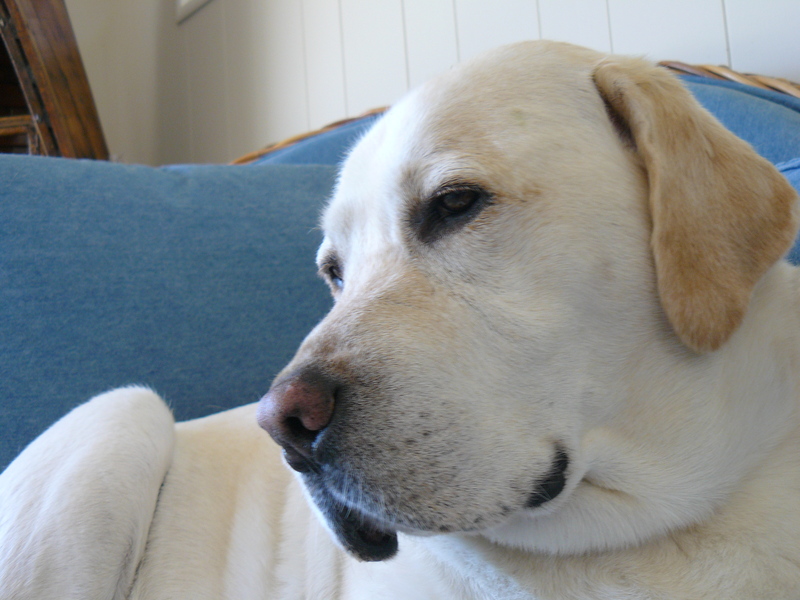 I’m spending the week-end with Cooper, a gentle Buddha in a dog’s body, who’s been teaching me since I arrived. At first we were distant, studying one another from across the room. I was tired, having driven miles out of my way, convinced I knew better than the GPS. Like the saying goes, a little knowledge is a dangerous thing. But I did arrive, saw some beautiful countryside and stopped to buy a gift of flowers, which unfortunately had rotten water-logged stems that I hadn’t noticed. My afternoon client session had gone well, if I didn’t count the gardener mowing outside the window, my client yelling above a leaf blower, and an occasional ambulance blaring up Melrose Avenue. Not the quiet sessions conducted deep in the forest I’m used to, but she was helped and I enjoyed working again. Unfortunately, the recording of her session produced a wave file instead of an MP3 (the mysteries of electronics), and I could not figure out where the file landed (the mystery of my computer) so that necessitated an unscheduled stop to see Stan, the computer man. I waited while Stan explained what was happening (operator difficulties) which is a nice way of saying I’m electronically brain-dead, which I already knew. He fixed the problem, sent off the client file and I bolted out the door, inching on to the Los Angeles freeway. Just another mercury retrograde day. You get the picture, so when I met Cooper I was less than congenial. The dog studied me, waiting for my emotional levels to move from explosive to simmer, then paraded his stuffed animals past my feet. I let him smell my hand, then stroked his head. He promptly got up, led me through the kitchen and into a back bedroom, where I found both food and feeding dishes. Cooper gobbled down copious amounts of food while I made a bed on the couch, cursing the fact that I’m still homeless. My dream rental fell through on Thursday when I opened the door into a space so small I had to hold in my stomach to get inside. I was coaching myself away from open windows and kitchen knives when a friend connected me with Teryn, a local queen of real estate, who not only took me to lunch, promising to help me find a new place, but also opened her home while she and her husband Bart went away for the week-end. So that’s where I am, rooming with Cooper. I woke at six ready to walk and discovered Cooper felt the same. Teryn said he needed no leash, which was a tad unthinkable, but I took her word. I untangled night time hair and put on a jacket as Cooper stretched and waited. Before I opened the door, he nosed toward the poop bags lest I forget, then waddled out in front of me. The old gentleman shuffled down flights of brick steps looking back to see if I was following. He was also making it very clear just who was taking who for a walk! Trotting ahead, Cooper peed on a bush, then waited patiently, like a parent with a lingering child. When I got close enough to touch him, he took off again, up a side road and around a hedge. I began panting and wondering how distant a walk he had in mind, when he dropped last night’s dinner in the grass and turned around. ( I got to do the part of dog walking I don’t like. Enough said.) We returned home the same way, with Cooper serenely waiting every few yards until he nosed his way to the front door. After wolfing an abundant breakfast, he urged me to play tug of war by dropping a green stuffed monkey at my feet. I grabbed the other end expecting a little equal competition. But actually thinking I had an unfair advantage, you know, being human and all. Ha! Not so. Cooper had the strength of a bull. That dog pulled me across the room like I wasn’t even trying. Not one to settle for defeat, I challenged him again. And again he won. And again and again. This dog could pull a car. We both took a snooze, then had lunch in the yard, where I read Tapestry, Barbara Hollander’s memoir about life in Spain. Cooper munched an apple. We mellowed in afternoon sun, a gentle breeze lifting the romaine in my salad. When Cooper finished his fruit and wanted to play, I refused. Once inside Cooper burst with excitement, pushing against my side and stepping with a horse’s weight on my feet. He loped to the bedroom, bringing out a brown monkey which he dropped until I agreed to pick it up. (The dog may be mellow but he’s extremely persistent.) Finally, I relented, grabbed the monkey and pulled hard, expecting to fly across the room again. But he surprised me. This time, he was gentle, pulled me a few feet, then feigned weakness, letting the toy tumble to the floor. The dog was letting me win! What kind of a dog does that? What kind of dog knows that? What kind of a dog takes me for a walk, shows me where his food is and the poop bags? Cooper, who in heaven’s name are you? I love Cooper! He’s a small boy in a dogs body.. You captured him well! Karen – What a wonderful writer you are! Great story about Cooper. Dog people are definitely not who we think they are as Cooper shows with intelligence and compassion. I’m imagining a wonderful home for you. Cooper sounds very special indeed. But I have to say, I bet it wasn’t just him. I bet his behavior and response had something to do with who you are as well. Robin Chilstrom (response above)…is that the Robin I know?? Angela Rodgers here. My god, it’s been decades! Yes, it’s the Robin you know.